In banking in the United States, cash management, or treasury management, is a marketing term for certain services related to cash flow offered primarily to larger business customers. It may be used to describe all bank accounts (such as checking accounts) provided to businesses of a certain size, but it is more often used to describe specific services such as cash concentration, zero balance accounting, and automated clearing house facilities. 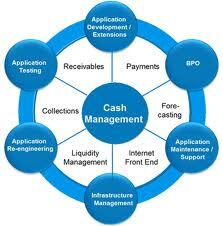 Sometimes, private banking customers are given cash management services. Do you forecast your cash needs for single period or multiple periods (for months & weeks simultaneously)? Do you use distribution- starting with data on relatively long period and breaking it down into relatively smaller periods, or scheduling- starting with data on relatively short periods and aggregating into longer periods? ii) Adjusted net income approach. Do you use any customized software for making these forecasts? What are the acceptable levels of errors regarding these? Do you use sensitivity or simulation analysis for measuring uncertainties? Does the firm hold extra cash, what is the approximate range? Does the firm maintain excess cash reserve for facing sales seasonality, factors considered for this purpose? Does the form maintain a reserve credit line with a bank or group of banks? Does the firm have to meet margin requirement for this purpose? Does the firm use options contracts? If yes, then which types of options? Whether the firm invests in near cash assets, what are those assets? Fixed cost components of the transaction cost of cash equivalents. Cash reserve maintained for bearing these fixed costs. Whether the firm invests in marketable securities when it has excess cash. Amount of investment in the securities by category. 1. Does the firm uses short term bank loans for financing its production costs or disbursements? 2. Does the firm use Lie of Credit? 3. With which banks the firm has such arrangements? 4. What is the possible credit limit of the firm?